With businesses operating in a highly competitive markets, understanding the nuances of talent movement can provide vital help in retaining talent. The backbone of the organisation is the talent which is very predominantly governed by the desire for improvement in productivity, enhancing better opportunities for showcasing the organisation growth amidst stiff competition that the firms are facing within and outside their industry space. The large focus is though on the ability to exercise minimal risk in order to achieve the levels of satisfaction in terms of the output and the longevity that arises primarily due to the effective retention strategies that the organisation evolves including the definition of so-called career paths and dimensions. No matter how hard the efforts of retention, there is still a level of Employee-Turnover which hampers the growth disturbs business continuity and sharpens the edges of the so-called competitive forces. Even the existence of pre-defined well-tried mechanisms to control the Talent Turnover does not necessarily prove dimensional in bringing this need to an end rather getting closer to the universe of the most unwanted Stagnation and Saturation levels which further de-impact the employee motivation levels. Ever since I have ever thought of this subject, I have always seen my thoughts scaling from the time before even this Talent was hired to after the Talent Turnover. As I focus deeper into this subject, I am even intrigued by the thought that all the retention efforts which are being exercised are either too administrative or largely short-termed. Rarely do we see that a retained talent exists without any proper hygiene of career path, development models or largely alternate career spaces which some organisation crates for identified individuals. 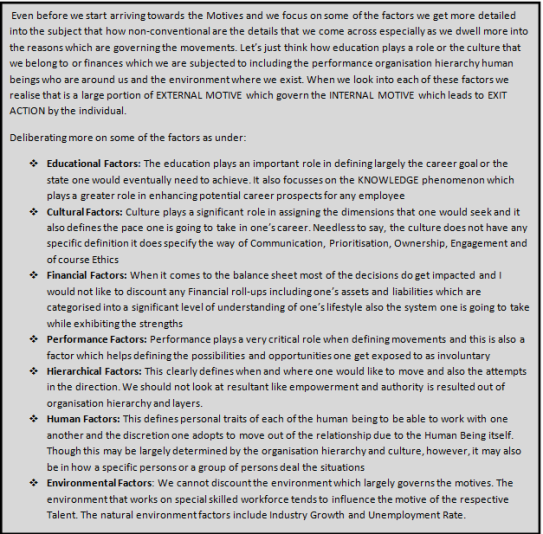 Though some of the above interventions do help organisations to make some continuity possible, however, I always focussed my energies into thinking that where did this evolve and the root-cause identification to eradicate this would be largely affected if we focus on the spectrum way beyond the conscious thought of a People Leader. A generic people manager challenges the environment around itself to be Human Resources for grading Salary Compartment or offering an out of the turn promotion or largely calling himself an effective people leader who leads and binds the team together. I am not here to discount any of the above employee engagement efforts as they are effective tools for the corrective measure which needs to be undertaken by any organisation who is being subjected to this context. But my thoughts surely roll down to the root cause for movement of a person and which I effectively define in a few words naming “motive for talent movement.” Whether this subject refers to the fact that talent moved into the organisation or it also refers to the talent which moved outside the organisation, the motive plays a very important role in this movement. As I dwell more on the same, I also came across interesting examples which helped me to empathise that how deep the subject of talent motives in the history of the organisations is. As I move ahead with this note, I am also aligning myself to some very primitive reasons for people movements which are hidden in depth in the broad model of Maslow’s Need Hierarchy. 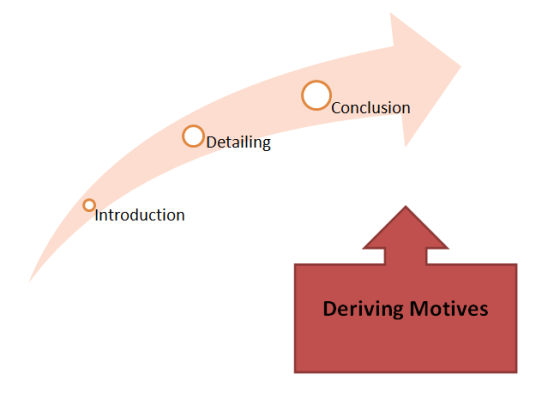 Motives clearly get influenced by the factors which help in scaling up the desire levels being influenced by each of the above categories. As we dig deeper beneath the layers the correct motives appear. For example, the broad reasons categorised by anyone could be summarised as better career growth, bigger job role, better compensation, larger geography, bigger brand name etc. The correct probing skill offers advantage to us in order to establish the correct motive due to which an individual is slating his movement. The mystery unfolds the correct motive which may require a proactive or reactive treatment in order to manage the same. This could be easily understood through a movement of stages which would unfold each stage till the correct motive is arrived. The skill would be to in our ability to derive the right motive and to utilise the thought process in arriving at the motive for which people are moving in the organisations. As we are aware, everyone works for one career goal which one tends to achieve through the career and the organisation one chooses to work for. Let’s maintain for the time being that everyone works for a career goal even if it’s just to continue working for a fixed income it’s still a goal. Once we arrive at a goal one is working for the various motives start surfacing across bringing a lot of clarity into why a person would continue or move out of a role. I do remember that while interviewing a hi-potential candidate for a role I actually started thinking about the next level which I would need to provide to this candidate for her to sustain in the organisation beyond 18 months. On one hand, I did deliberate my assessment on the competencies while on the other hand, I started focussing on her motives for the current movement and her restlessness in her current organisation and obviously how vigorously she wanted to move ahead in her career. Enough probing on this helped arrive at the educational and cultural combined in arriving at her motive for movement. Also, I did keep into the account the answers every-time did not direct me to the right motive including effective probing skills. The consulting skills play a very important role in questioning the motives. Some of the examples classified below highlights some triggers around this process. While above is carried out by most of us, we do get challenged by some of the Blind-spots which are observed as the process moves ahead. There are also series of questions to arrive at the blind-spots which may get recovered while the process of identifying the motive for movement continues. The process moves ahead with a golden rule that nothing is right or wrong and the process needs to be simply followed and not left in the mid-way. There could be a series of analysis against each of the factors behind motives of movement. Mostly, this helps in identifying what truth is not presented and how things are as they don’t look to be. 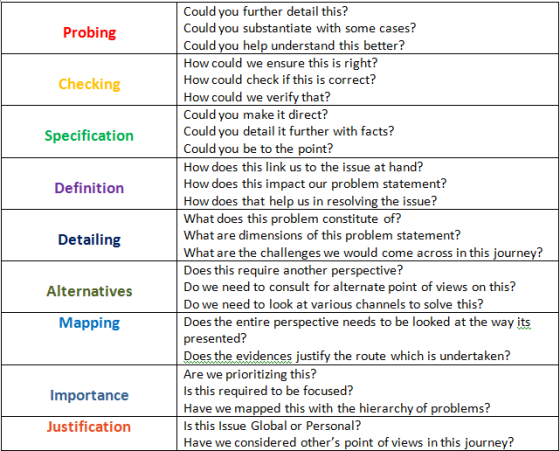 Some of the standard consulting questions below also help us in highlighting the potential blind-spots by developing the consulting skills amongst HR managers in arriving at the things the influencing target does not see/want/know but may not have specifically stated. 1. Where are you trying to head? 2. What’s the biggest disaster you could think of in this situation? 3. What is getting you sleep-less nights? 4. What would be your action if it’s not important? 5. What do you think most of other people are concerned about? 6. Who do you think could be of some assistance? 7. How can you make a difference to this scenario at hand? 8. How do you think you could be more participative? 9. How can this be shifted to serve a greater good? 10. What do you do be calmer in this situation? 11. What all discussions regarding this are still pending? 12. Do you think you have missed out anything important that you know of? 13. Are you being apprehensive of some pending action which you are supposed to take? 14. Have you analysed other’s point of view on this? 15. How could you speed up things? 16. Is this within your control? 17. Do you think you could do something to reduce the risk in this situation? 18. How do you ensure a clear path for yourself regarding this matter? 19. Can you influence other people by discussing this idea with them? 20. What hampered you from taking an action in the past on this? 21. What would make you feel satisfied on this? 22. What do you think are the risks that threaten you of this action? 23. Can you think of an alternate solution to this problem ? With the above analysis of arriving at the Motives of movement, basis the classification and segregation of the questions, we would be in a position to remodel some of our thought processes which assist in arriving at the consensus within us and the remaining stakeholders who need to be convinced with our ideas and thoughts. Largely, factors human in nature define skills which one needs to adopt for the right skilling of human capital and upskilling them with the newer technologies in the space and a lot of additional data which may prove helpful in getting the thought process more defined in this direction. 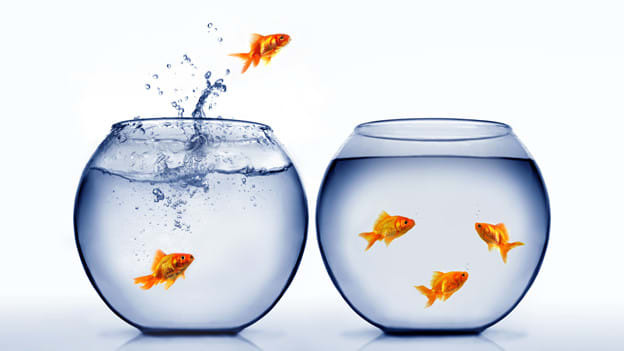 We as HR leaders may not look at controlling the employee turnover but largely classify the Talent Retention Strategies into the defined buckets which may need specific deliberation wherever required right from the time of Talent Acquisition. Vikas Khokha is currently leading the role of HR in Zimmer Biomet India, a healthcare organization.